Over the last year or so since discovering Whole30, I’ve rediscovered my love of salads. Whole30 has been good to me, and eating this way became second nature about 70% of the time. When sticking to this eating regime, which is mainly protein, veggies, fruit, healthy fats and cutting out sugar, dairy, gluten and processed foods, I feel great and have tons of energy….and no brain fog. I think I’ve mentioned I feel 10 years younger! Seriously! Over the last year, we’ve been blessed with the opportunity to take several family trips, and when traveling we pack a cooler and bring food with us. I’ve found that not only do I feel better when traveling to have my own satisfying food, but it also cuts out a lot of bad choices we tend to make when we don’t have the options we crave. I guess part of the reason I travel with my own food is to have control….control over what I eat and when I eat. I must say it keeps you speeding along when your food is already cooked and right there with you. Now this is not to say I don’t have my fair share of splurges, but because I’m able to eat a good percentage of my food from my own stash, I’m not wasting added calories on foods I don’t really care for. For example, on our recent trip to New York, I had indulged daily on NY bagels, and had NY pizza on 3 occasions that week. It was so worth it! And we were also doing a lot of walking everyday, so that helped offset caloric overload. 😉 It also helps with the budget. I have to admit it’s been hard getting fully back on track since returning home. We’ve found a Brooklyn Water Bagel place, and their bagels are fairly close. So I’ve had bouts of running great with my clean eating, and then have a week we’re all eating bagels. Man, I finally know what New Yorkers mean when they talk about their pizza and bagels! They aren’t necessarily evil, but eating white flour makes me more prone to sugar cravings. It’s hard for me to be moderate with sugar….I tend to be all or nothing. So in coming off a rough 5 days or so of sugar intake (which happened while sick which makes it more of a double whammy on my system because I wasn’t exercising…..which counters some of the irritable effects of sugar), I am now craving these salads again, and higher protein and veggies. I had fun last week getting into some fall cooking and baking. I made butternut squash apple/pear soup, gluten-free pumpkin muffins, chocolate chip cookies and cherry cheesecake bars which are still in my fridge. Oh and let’s not forget a fellow blogger’s apple fritter cake that I just had to try! The soup is amazing, and helped offset the sugar beast. But the chocolate chip cookies were a bad idea, and because I didn’t make them gluten-free, they sat like a lump in my stomach Friday night (and maybe Saturday too). My cold is finally subsiding….I’m feeling better today, and got back to my strength training routine this morning. I also made a pitcher of green smoothies. It makes 3 pints, and I drink 1 a day. It really helps with the sugar cravings. This salad is fairly straight forward, and I usually bake my chicken breast with a homemade greek marinade. It’s easy to throw together when I keep the chicken already cooked and in the fridge. 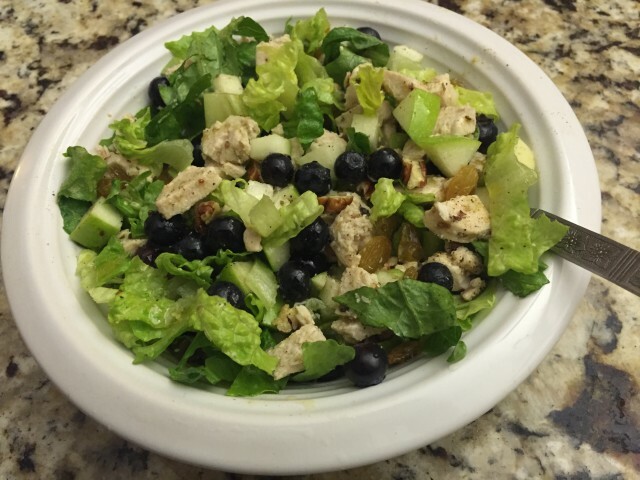 Another favorite of mine lately is chicken waldorf type salad which has been another staple of mine this year that I need to share. Hopefully you’ll be seeing a lot of recipe posts coming up along with our travel adventures I can’t wait to share. Stay tuned! Can use pre-cooked rotisserie chicken, but I used organic chicken breast marinated in a homemade greek marinade.